From left are Portfolio Councillor of Human Settlements David Willemse, Minister Bonginkosi Madikizela, recipient Anele Gantsu, and Ward Councillor Langa Langa. 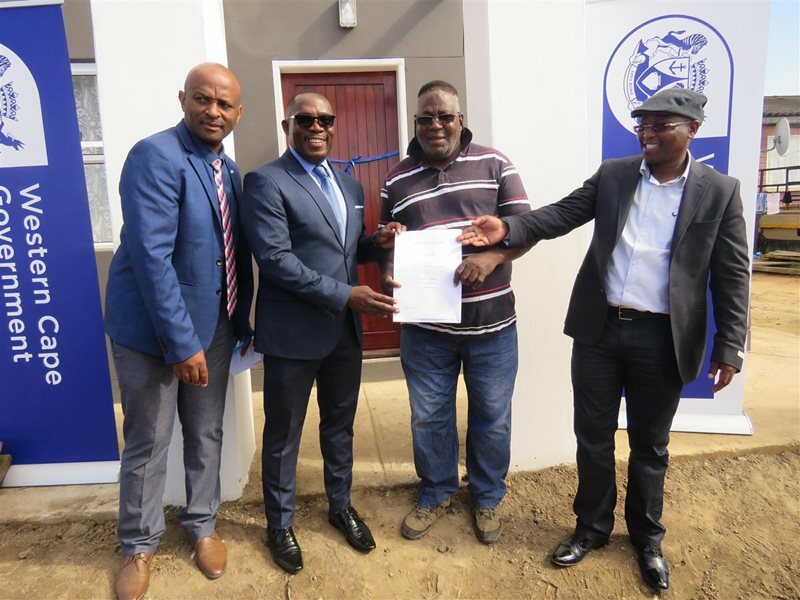 GEORGE NEWS - The Minister of the Western Cape Human Settlements department, Bonginkosi Madikizela, handed over 20 houses to elderly residents of Bungalo, Thembalethu this morning. The area called “Bungalow”, in Zone 1 and 2 near the Thembalethu Square, has some of the oldest wooden houses in Thembalethu and is considered as the oldest settlement by black people in George after Lawaaikamp. It is more than 32 years old. The Thembalethu Bungalow Project resumed in January and a total of 600 houses will be built for qualifying residents, the first 200 of which are currently under construction. This project is intended to replace the dilapidated bungalow houses in Thembalethu with brick houses. The total budget for phase 1 of this project is R32-million and the estimated completion date is February 2020. Among those who accompanied the minister to the handover was the mayor of George, Melvin Naik.